STATE OF MATTER (SOLO EXHIBITION) 2014. September 13, 2014 - October 18, 2014 | The Invisible Dog Art Center | Brooklyn, New York. S.O.M. BOOK. MATTER ON MIND - Elements & Cosmogonies: 0 State of Matter Circle /// 1. Initiation /// 2. State of Matter Drawings /// 3. Table of Elements / Embrace #1 / 9 Month of Initiation (S.U.N) / River Stone (Reflection Series) / Botanê (S.U.N) / Pyrite (Reflection Series) / Fossil Fractal Fingerprints (Touch Series) / Organic Material (Reflection) / Bean.Beings / MatterMirror / TacTus. DigitiSignum (Touch Series) / ABC Sphere / Intra / Gestalt (S.U.N) / Imago (Octava Arcana) / Meta.Morphic #1 / Amulets (Vestige Series) / Nests & Seeds / Mask.Unmask (Intuigrams) / Graphite (Intuigrams) / Coral & Driftwood (Intuigrams) / TacTus Garden. DigitalData (Touch Series) / Fossil Fractal Fingerprints (Touch Series) / Meteo.Rites /// MIND ON MATTER - Creation Myths: 4. Pregnant God /// 5. Rib Scriptures /// 6. She Rib /// 7. Logos /// MIND = MATTER - Esoteric Matter + Poiesis: 8. The Hermaphrodite Brain /// 9. Healing Matter Amulets /// 9/1. Brains.Eggs /// 10. Refraction /// 11. Between Two Nights /// 12. Embrace #2 /// METAPHORIC MATTER - Elements & Substances & Intuigrams: 13. S.O.M Concentric Circles /// 14. Photo.Synthesis /// 15. Leaf.Intuigram / Photo.Graph /// 16. Leaves Intuigrams /// IMMATERIAL / NON-MATTER: 1.0. Amnios / Memoria Celular / Meta.Phore / Nine Months of Initiation Poem / MatterMirror / BeanBeamBeing 1.0.1 Materia Prima / DigitiSignature / DigitiSignum / Meta.Morphic / Beauty: The Periodic Table of the chemical elements / Geo.Drawings 1.0.1.0. Mighty Matter / Kintsugi / Golden Crack / Fissure 1.0.1.0.1 HYLE / H1 / H2 /// DDD. The Book of Dreams / The Book of Days / The Book of Death 1.0.1.0.1.0 The Object Consumed / Photo.Graph (De.Materialization) / Poiesis / Light Quintessential / Opus / Mate.Reality / Per-Forms / Gestalt / Text Ritual / Thoughts as Things / 3D Printing - BioLanguage / ESSE intro. Cuban born artist Claudia Paneca’s first US solo exhibition State of Matter takes root in The Glass House at The Invisible Dog Art Center in Brooklyn, New York. Recalling a green house that facilitates the growth of plants, the exhibition space lends itself to the nature of Paneca’s environmentally immersive work. The Artist poetically meditates on matter through the use of organic materials such as porcelain clay, paper and wood. She creates minimal sculptures as a metaphor for cosmogony, in other words, how humans’ universe may have come into being. Like a scientist presenting research, Paneca displays her monochromatic artworks in the shape of a circle - leading the viewer through her imagined ontogenesis. The core of the show lies in the installation S.O.M. 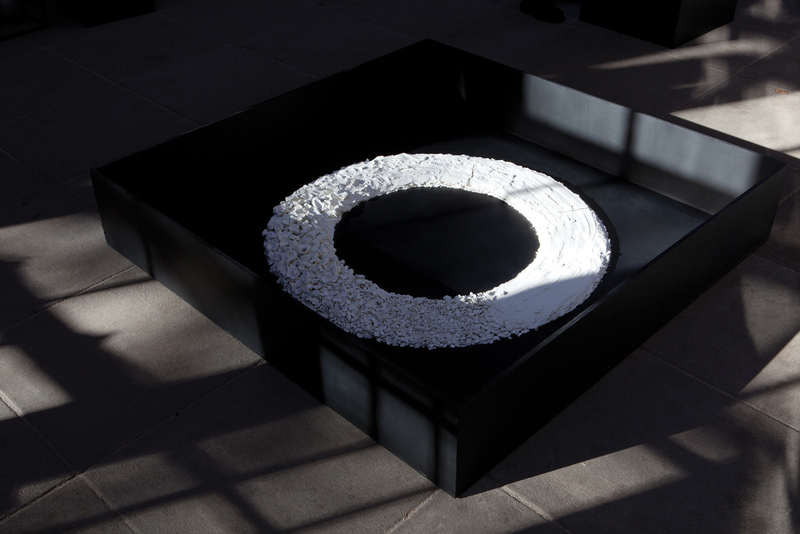 State of Matter Circle exhibited at the center of the space. Constructed from a ring of clay that symbolically suggests the exhibition as a whole, the material morphs from wet, to solid, and finally, to powder. A simple demonstration of the cycle of life, this large work is ephemeral and will transform over the course of the exhibition as it dehydrates, before it disappears, leaving only photographs and white dust behind it. Here, the Artist allows the material to act on its own. Paneca hardly interferes. Yet, it is in the few hand-strokes she applies to the clay to guide its shape, that the soul of the work is fully experienced. This is the sculptor’s second iteration of S.O.M. State of Matter Circle. Much larger than the first, this growth alludes to the direction in which Paneca’s work is evolving and her itch to build big if the space and techniques allow it. It also demonstrates the relevance of the work to her practice. A work that titled her exhibition and is a natural progression from the Artist’s 2008 ongoing Concentric Circles series with circular iconography at its root. For the exhibition, she imagined a new version of her optical illusion rings by creating a site specific piece that has a hand shaped porcelain spine coming out from it. As the viewer discovers the show in a clockwork round motion of its own, Initiation, Rite of Passage falls from the ceiling as another spine to come rest on the ground, revealing yet but an additional circle in its tale. The small porcelain bean-like sculptures that form it are stringed one on top of each other. In a laborious repetitive process, the artist molds the white clay in her hand – giving each individual piece a unique rounded shape. This ritual recalls her 2013 Ofrenda performance where participants were invited to make a finger print on a small ball of clay. For the Artist, “this intimate gesture transforms the basic material of clay into a simple, living representation of the creative act”. Initiation, Rite of Passage was actually inspired by the Artist’s numerous poetry entries on the creation of a human body and its evolution. In the same vein, she seems to apply its process to making an Artwork. Mixing science with myth, Paneca invites to ponder on our entrance into life and plays with the idea, common to most religions around the world, that man came from clay. The artist re-appropriates established myths and gender status with a godly touch of humor, and presents works such as Pregnant God and She Rib. As their titles indicate, these two pieces take a feminist, perhaps more realistic view, on the patriarchal legends that have forged our societies. Similarly, the minimal The Hermaphrodite Brain sculpture reflects on the public discourse around gender affiliations connected to the left and right cerebral hemispheres of the vertebrate brain. By splitting her smooth egg-like porcelain sculpture in two perfectly identical halves, Paneca creates an allegory on our ways to conceive gender and biological interpretations. Though porcelain is most present in the exhibition, the Artist explores a variety of other mediums throughout the show such as white ink drawings that bring to mind studies of the mysterious galaxy and our deep oceans combined. Circular webs leave ghostly traces on the black paper surface, inviting the viewer to contemplate Paneca’s personal rendering of our environment. Placed across in dialog with these drawings is Between Two Nights, a large installation that uses the exhibition backdrop as the main canvas to the work. The Artist cleverly transcends the 2D surface by letting the ceiling high canvas flow onto the ground. She blows on stars with marble dust, and places geometric shapes at its base, thus contrasting human-made versus natural and spiritual versus physical. The series Embrace and Refraction encapsulate these oppositions by juxtaposing found, reclaimed wood with Paneca’s white sculptures that gracefully respond to it. Displayed below the drawings, is a table of curiosities. Reminiscing on basic living forms, her works bring to mind delicate pieces of coral, fossil or bone. Among these little treasures, some of which are also scattered around the exhibition, is a notebook filled with her writing. A small example of what is a predominant practice in her Oeuvre. She begins her process by jotting her ideas down, possessed by a stream of consciousness inspired by her readings and research on philosophy, mythology and science. Her metaphysical verse then shapes the porcelain molded through her fingers, almost unconsciously as a flowing morphogenesis. Perfectly exemplified in Logos as the absence of words in her symbolic book allows the viewer to freely interpret the Artist’s personal vocabulary. One concept leading to another, Paneca’s Darwinian imagination grows, reinventing the world as we see it.